With the winter weather having properly set in, it’s the perfect time to invest in plastic grit bins, as well as salt and plastic shovels (which we create using our rotational moulding process). Obviously, actually clearing away snow and ice needs to be done with the utmost care to save yourself an injury, so we thought that this week on the blog here at Excelsior it might be an idea to go over some top tips on how to use these tools most effectively. This might not be the most welcome bit of news to start off on, but we’re afraid that clearing away snow and ice is very much an early morning job. The very first obvious advantage is that there are fewer people crossing your path (literally) who might be at risk of slipping up. However, there are others too – you’ll find it far easier to clear snow and ice earlier in the day, when it’s fresh and loose rather than hard and tightly packed together from the weight of people walking on it. Plus, if you remove the top layer of snow first thing in the morning, it helps the day’s sunshine to warm the ground more effectively, further preventing any more snow and ice from forming. You can then cover the path with salt again before leaving for the night, so that it’s less likely to refreeze overnight. So Then – What’s The Best Way To Grit Your Pathway? It all comes down to how salt actually works. If you like, it acts sort of like a molecular sponge, drawing up the frozen water molecules and breaking the bonds between them, lowering their freezing point in the process. This means that above all, the spread of salt is the most important factor in effectively clearing your premises. Each pellet of salt is vey effective within its own certain range. There’s no universally right answer for how much you’ll need to use – it’s mostly a matter of trial and error. Start small and scale up, and if you find that your path is clearing but you’re left with clumps of salt about the place, you’re almost certainly using too much. When you begin, start by making a path straight down the middle of the area, which will be cleared first, so you’ve got firm footing to work from. Then, salt needs to be spread evenly in a large field across the surface. Pay particular attention to clearing snow and ice from steps and steep pathways, as you might find these need a little extra salt. If you’re unlucky enough with the weather, you might have room for a little trial and error as you experiment with exactly how much you need, and how’s best to spread it. Remember – an even spread is key! 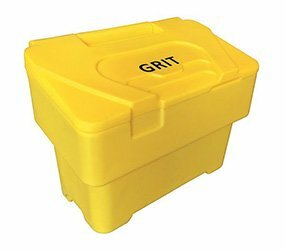 Here at Excelsior, not only do we stock our own roto moulded grit bins, but also our own shovels and salt. We use 25kg bags of white rock salt throughout winter, and unlike brown salt, it doesn’t leave any residue once it melts, making it an eternally popular choice amongst our customers.